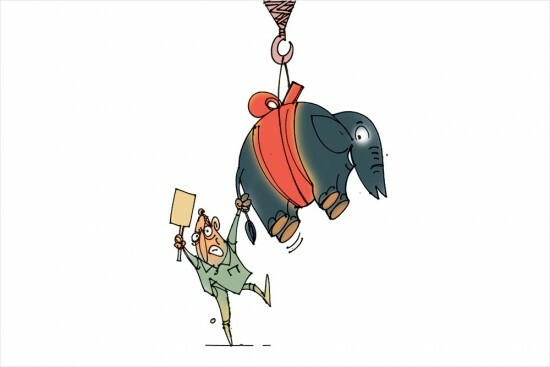 Sri Lanka has had a tradition of gifting elephants to cement bilateral rela­­tions with friendly nations. But a recent move to send a baby tusker to New Zealand as a goodwill gesture has kicked up a storm. Six-year-old Nandi was bequeathed to the Kiwis during the visit of former New Zealand prime minister John Key in Colombo last year. A team of vets from New Zealand subsequently came to Sri Lanka to prepare Nandi for her journey to the Auc­k­­­­land zoo. But animal activists in the island nation have risen up in pro­test, saying it would be cruel to separate her from her family. They also assert that Nandi would find it difficult to adapt to the cold climate. The matter has since reached the court and Nandi’s departure has been put on hold, pending a final decision. “Sri Lankan elephants have strong family ties and to take a child is a sin,” a Buddhist monk and animal activist was quoted as saying. After facing flak for using pellet guns on protesters in Kashmir, secur­ity forces are likely to be armed with ano­ther unusual weapon to deal with violent, stone-chucking mobs: a grenade filled with a spicy jelly that causes irritation in the eyes after exp­loding. The grenade case will be packed with oleoresin, a semi-solid extract in a solution, mixed with the spicy gel. The spicy shells are said to be effective mob quellers. The plastic body of the grenade melts when it goes off, making it difficult to throw it back. The suggestion to use this came up during a recent meeting of the Union home ministry, which was convened in the light of the SC’s suggestion to consider measu­res other than pellet guns to contain mob violence. This, however, does not mean that pellet guns will disappear. It will, of course, be used only if less lethal weapons prove ineffective. Scramble Of The Fake Eggs! Anita Kumar, a Calcutta housewife, had the shock of her life when the eggs she bought from a friendly neighbourhood market spread out like plastic on the pan. To her horror, she found out that the shells were inflammatory too. The news of the fake eggs spread like wildfire, prompting the police to arrest the owner of the supplying agency. Altogether 96,000 samples were sent for lab tests, which were believed to have been “manufactured’ in Andhra Pra­­desh, which supplies 80 per cent of Bengal’s eggs. Exp­­­erts say it’s is no rocket science. All you need are calcium carbonate, gypsum and sodium alginate to create the eggs, with dangerous chemicals like benzoic acid and mercury to create the yolk. What happens to a monk when Cupid strikes him? Matrimony, perhaps! Thaye Dorje (33) has given up his monkhood after marrying his ‘close childhood friend’ RinchenYangzom (36) recently in Delhi. Dorje, who has since childhood claimed to be the reincarnation of the Karmapa Lama—the 12th century leader of one of the four schools of Tibetan Buddhism—says he has a strong feeling deep within his heart that his wedding will have a positive impact not only on him but also for the lineage. “Something beautiful, something beneficial will emerge, for all of us,” he says. Educated in India and Europe, Dorje will continue “as the lineage lama and as the Karmapa by offering teachings and blessings to students around the world”. He has faith that his students will understand his wish to have kept private “this personal element of his very public life”. It’s a real problem of plenty that a Pakistani man has run into in recent days. Sardar Jan Mohammad Khilji is shocked to find out that the official registration form issued by the authorities for the ongoing census in his country has space for only 33 entries in the children’s column. The 47-year-old resident of Quetta has actually sired 38 kids and is wondering if five of his children would actually make it to the census figures for want of space on the form. A medical technician by profession, Khilji incidentally has three wives. His eldest son is 14-year-old. The pollution created by building and road constructions are a hazard to public health. Many wear protective masks. But now, the Nepal Medical Association has advised people to use masks in Kathmandu. The NMA said the Kathmandu Valley has been flooded with patients suf­­fering from obstructive pulmonary diseases due to the near-constant digging of roads and laying of utility pipes, leading to an alarming rise in such diseases as common cold, bacterial tracheitis, bronchitis, pneumonia, throat allergies and asthma. It is a policeman’s duty to crack down on crime and criminals. But you don’t often hear of them going after monkeys, esp­­­­­e­­cially those that steal cellphones from foreign women. But such is the case in Sri Lanka. A 26-year-old British woman lodged a complaint in Anuradhapura that her phone was stolen by a troup of monkeys. The woman, a trainee nurse at the Anuradhapura Teaching Hospital, told police that the monkeys broke into her room and made away with her cellphone worth Rs 50,000. Initially, the spirited woman tried to give chase, but the primates proved to be much smarter and elusive, forcing her to seek the police’s help in utter desperation. There is often a tendency among sections in the developing world to fall back on foreign experts, especially those from the West, to find solutions to problems that are essentially local. But now, Pakistan’s Supreme Court seems to have intervened on one such occasion and asked the government as to why local problems cannot be resolved by experts from within the country. “It is sad and painful aspect of the matter that we wait for some magician from outside to come and change the face of the country,” Justice Ejaz Afzal Khan of Pakistan’s Supreme Court said during a recent hearing on the suspension of work of the Lahore metro rail project. Work on the metro’s ‘orange line’ had to be suspended following a ruling of the Lahore High Court as it felt the rail project threatened several heritage buildings in the city. UNESCO wanted to inspect the heritage sites endangered by the metro. Now, the opinion of Pakistani experts will be sought. The Lahore government and several other agencies then conducted tests and concluded that the buildings were safe. But the local court had other ideas and continued to suspend the metro project. Meanwhile, the United Nations Educational, Scientific and Cultural Organisation (UNESCO), which has declared Lahore’s Shali­mar Gardens a world heritage site, got to know about the controversy and sought permission to visit Pakistan to make an on-the-spot assessment. But their visa application in January was denied. Now, they have made a fresh application and want to visit Lahore this month. “It was expected that work on the Orange Line project would remain suspended until someone could come and teach us how to protect and preserve our historical monuments,” Justice Khan observed. According to the daily Dawn, apart from Shalimar Gar­­dens, altogether 11 historical sites in Lahore, including the Gul­abi Bagh Gateway, Buddhu ka Awa, General Post Office, St. And­rew’s Presbyterian Church and Baba Mauj Darya Bukhari’s shrine were all being threatened by the metro rail work. Justice Khan pointed out: “We ourselves are conscious that heritage buildings must be preserved and protec­ted.” But he expressed surprise that the entire debate was sparked off only after the metro rail work had begun and not while enc­roachment of these buildings were taking place for years. Whether suspension of the metro rail work remains or is lifted will be known in the coming days after Justice Khan delivers his final verdict. But it will be based on the opinion of experts who are Pakistanis, not outsiders.